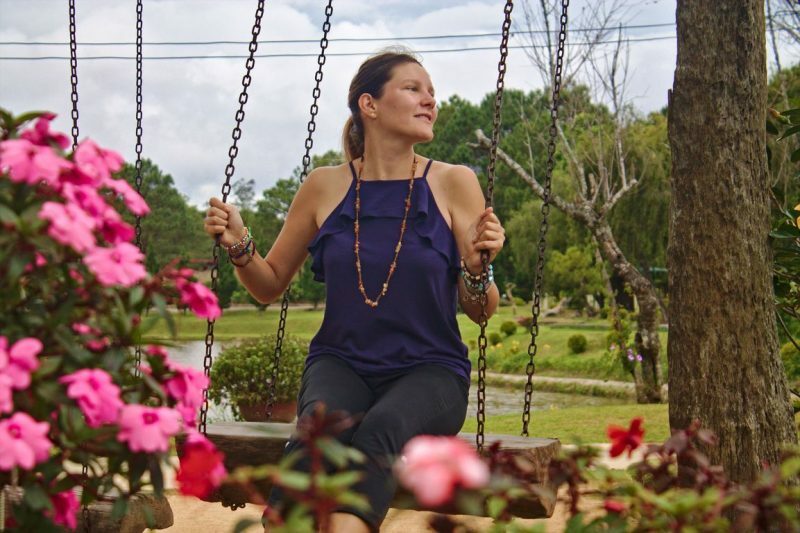 If you want to see another side of Vietnam, you should head to a small but charming city in the Central Highlands, called Dalat. The cool climate is a pleasant change from the heat, making it the perfect getaway, already since the French colonial times. They say that: Da Lat has four seasons in one day. Spring in the morning, summer in the afternoon, autumn in the early evening, and winter at night. Keeping this in mind, make sure to have flexible clothes and be prepared for sudden weather changes. Not only the tourists benefit from refreshing temperatures, also a variety of vegetables, fruit and flowers do. 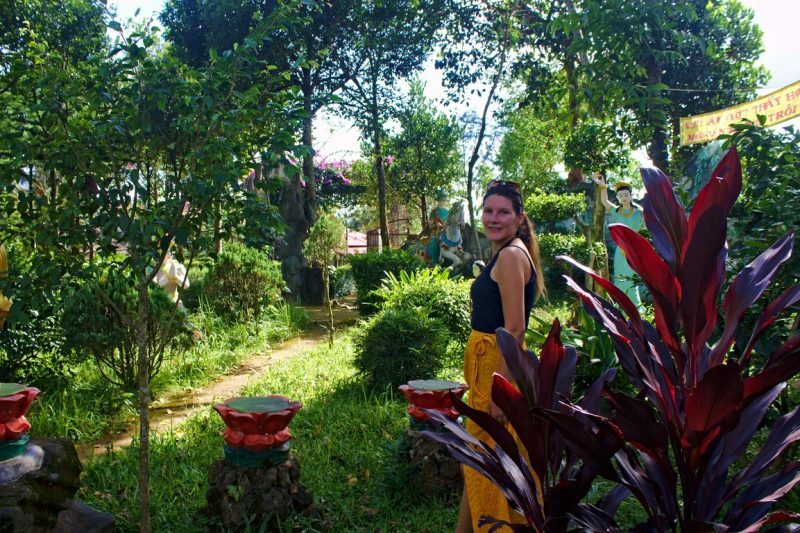 Moreover, Dalat is a popular honeymoon destination for the locals. 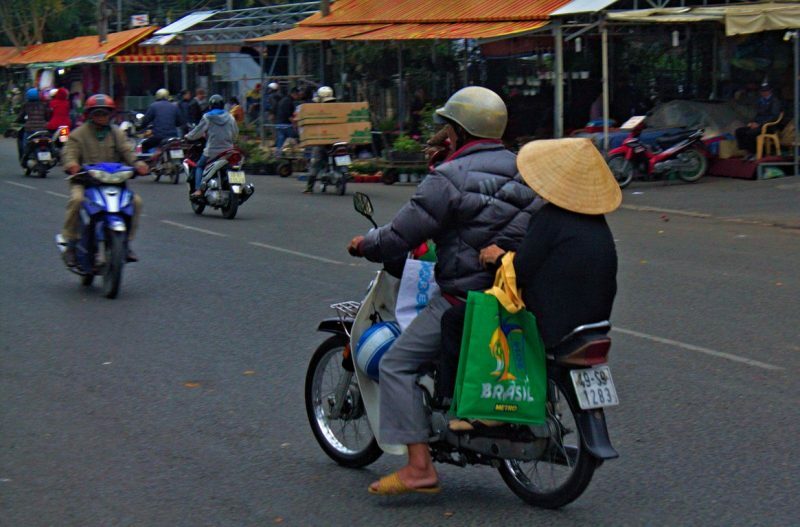 If you’re heading towards Nha Trang, Mui Ne or Saigon, make a stop at Dalat. 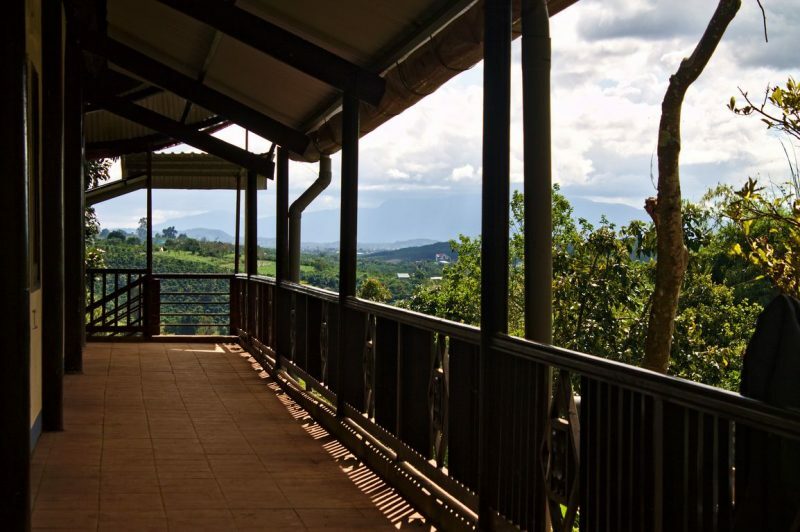 You will be mesmerized by the scenery and the abundance of activities you can only find here. 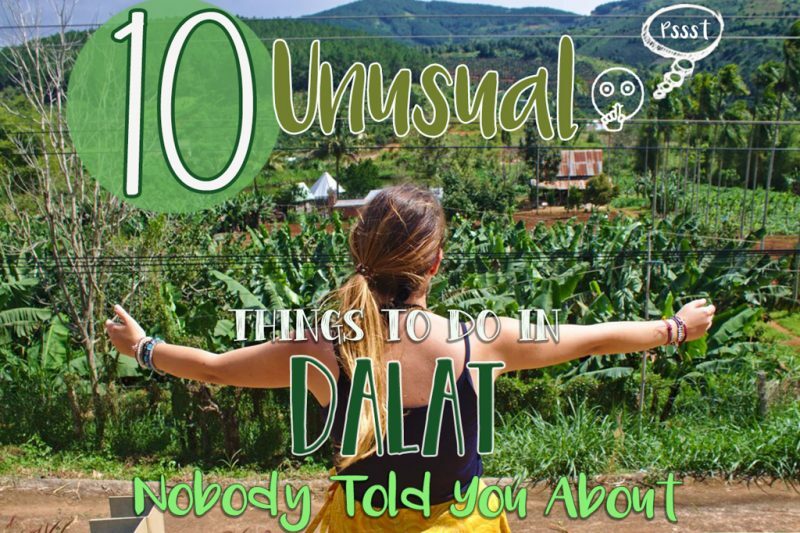 Exclusively for you, we have put together 10 Unusual Things To Do In Dalat. Get on a motorcycle and ride along the winding country road. 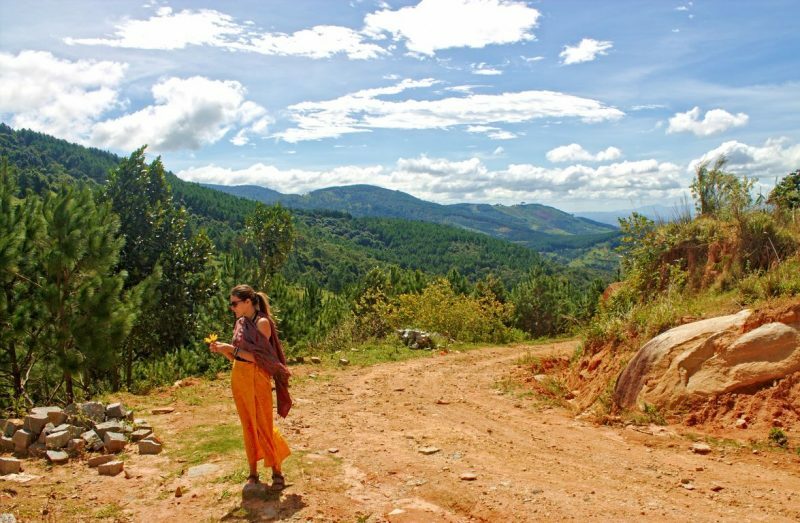 Immediately you will make the observation that Dalat is so much different than any other destination in Vietnam. Proof can be found in an unusual big range of flower fields, pine tree forests and way too many greenhouses where all the fresh fruit and vegetable grow that end on the sale counter of the local markets. Look out for idyllic snapshots such as this peaceful scenery that we have discovered along the way, captured in the photo above. Matcha is a green tea powder from Japan which is also very popular in Vietnam. This beverage will appear on every menu card in both variations: hot or cold. We like the cold version more as it’s refreshing on a hot day. 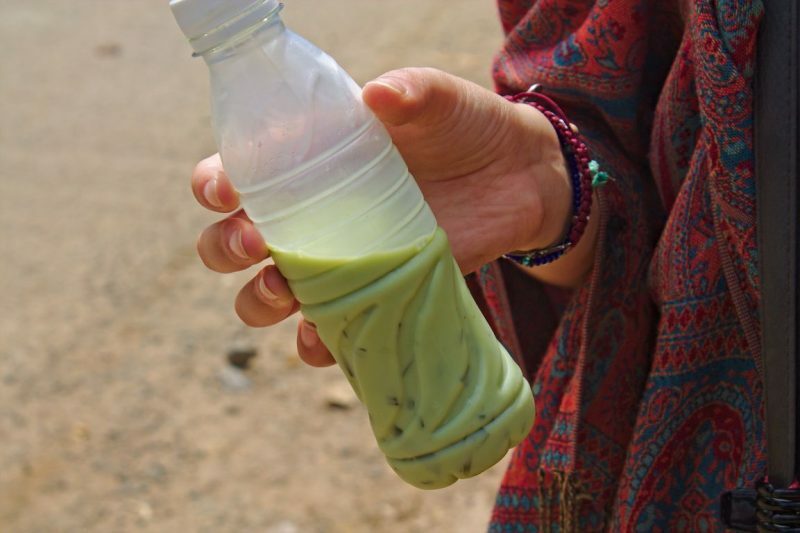 Many locals make their own Matcha tea drink, mixed with milk and gel bubbles. They’re filled in bottles and sold in many stores. 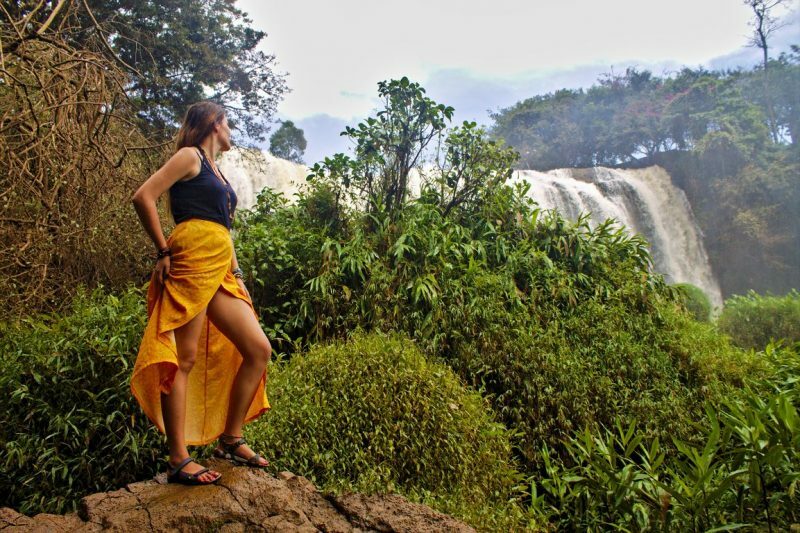 Although we have already conquered countless waterfalls, never before the path to a waterfall has seemed as adventurous as the one leading to the Elephant Falls. This waterfall is packed with pure adrenaline. To get the best view, you have to clench your teeth and accept the risk. 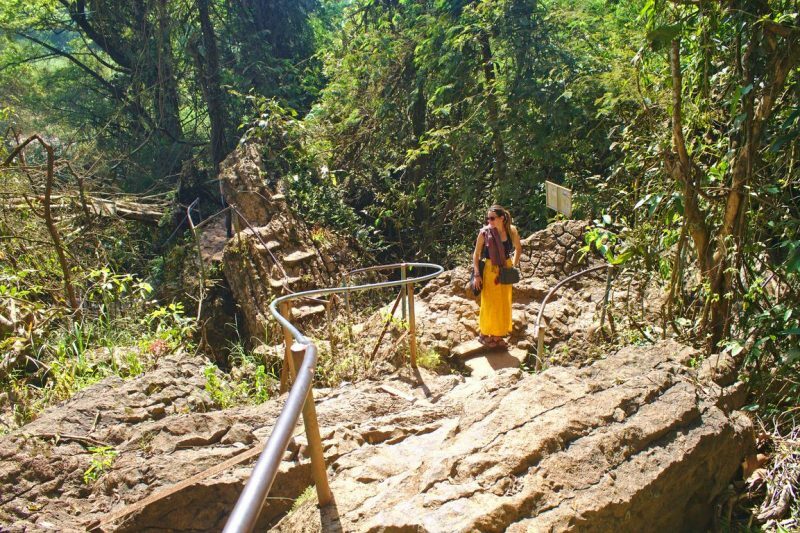 The hiking route is loaded with dangers including steep slopes, deep gorges and strong river rapids. Mastering it is only for the brave. We were successful until the last part. Crossing a rapid and climbing up a rock you can hardly hold on to has become our downfall. That’s why we were not able to catch the complete waterfall from the front. But instead, our perseverance was rewarded by a satisfying view on the upper plateau. If you want to tackle the Elephant Showers and make it till the end, wear sturdy shoes, accept the limits of your body and take care of yourself. 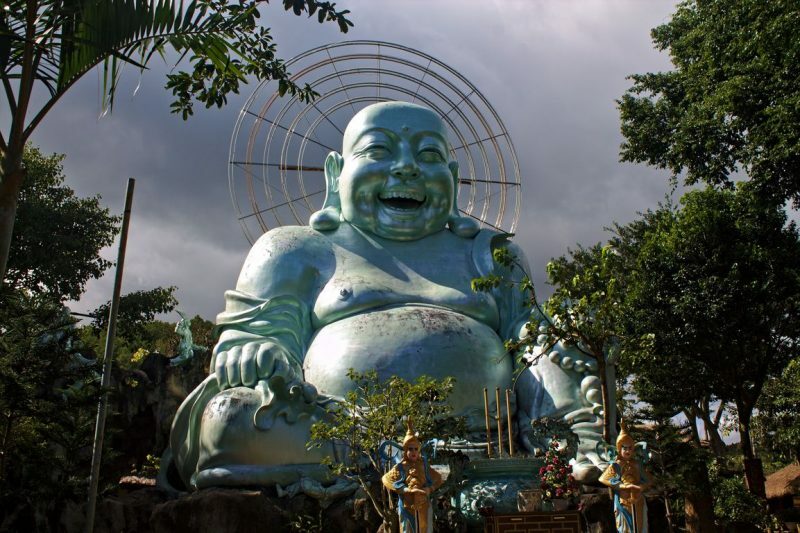 Only 400 yards west of the Elephant Falls you will be greeted by a super huge statue of fat Buddha covered in shiny blue. He sits behind the Linh An Pagoda with a broad contagious smile on his face, exposing his giant round belly. If you look closer you will notice that an outlook window is built in the belly, which means that it’s possible to access the inside of the statue, however it is prohibited for random visitors. The Ancient House is part of the Pagoda and involves many interesting sights. It’s a peaceful place and it can happen that you have it fully to yourself. You will encounter many spiritual notes tagged on boards, inviting you to come inside for a rest. Further there is a thematic garden with different Buddhist statues telling the story of Buddha’s journey of enlightenment. When you take the main highway inland, look out for a viewpoint, most probably there is already a bunch of people standing around. Especially for sunset it’s a popular spot for photos. 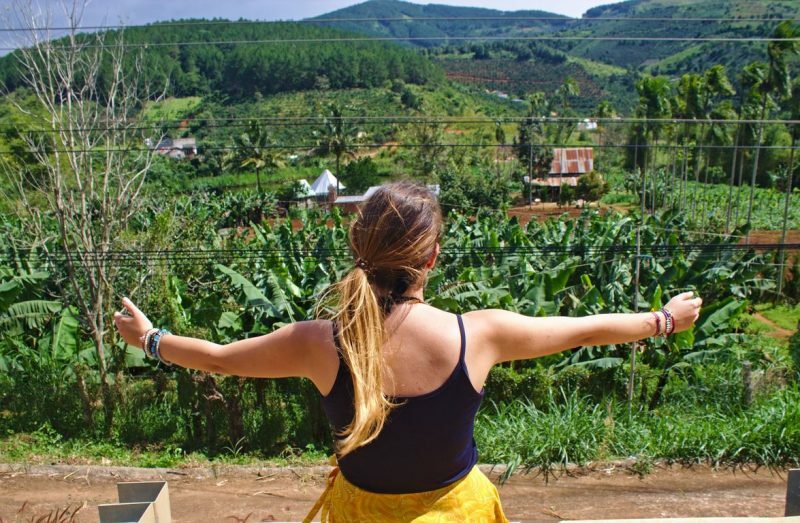 You can catch a first glimpse of how colorful the countryside of Dalat looks from here. Once upon a time, there was a Utopian designer who wanted to combine architecture with her love for the environment. The result of her ideas is stored in the Crazy House. Hang Nga, the daughter of a Vietnamese president in the 80es, has not been deterred from her dream to create a visual masterpiece, despite the lack of public support. 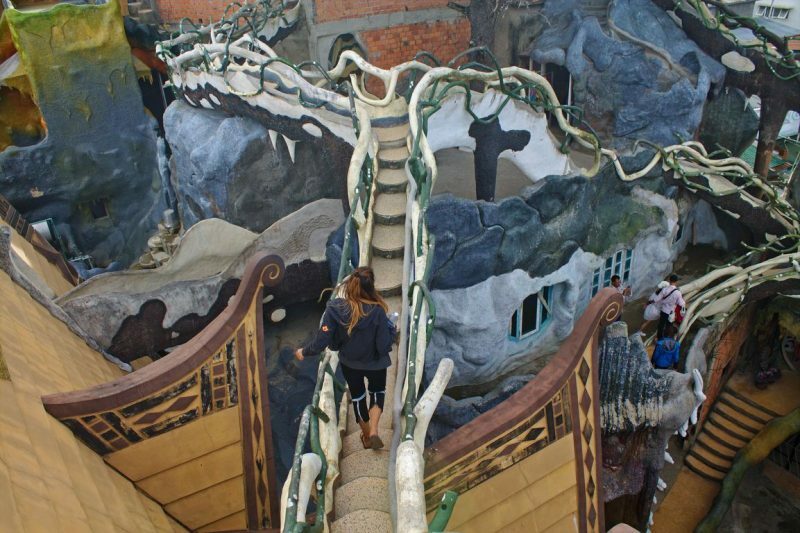 Crazy House consists of several individually designed buildings connected by winding stairs, tunnels and caves. In this way you can explore every little nook and cranny. It’s an ideal blueprint for planning your own dream house. Every room covers a theme with furniture and design matched to this theme. For example, in the Ant room you will see a gigantic wooden ant crawling around. 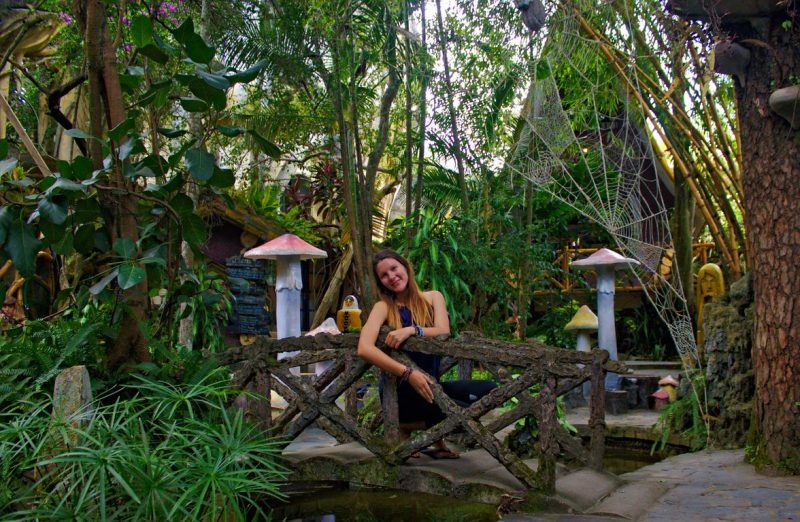 If you want to experience what a cross between Gaudi, Dali and Disney looks like, we’re quite sure that you can only do that at Crazy House. Doesn’t this look like Cinderella? 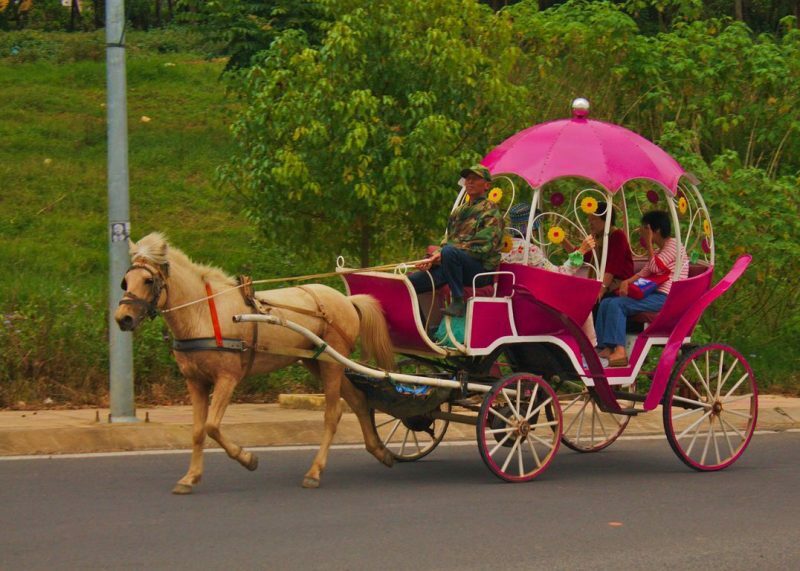 We couldn’t miss the romantic horse-drawn carriages touring around the Xuan Huong Lake. Each carriage holds a unique design adopted from a fairy tale. Xuan Huong is Dalat’s main lake. On the Northern side you can visit one of the most enchanting gardens: the Flower Park. 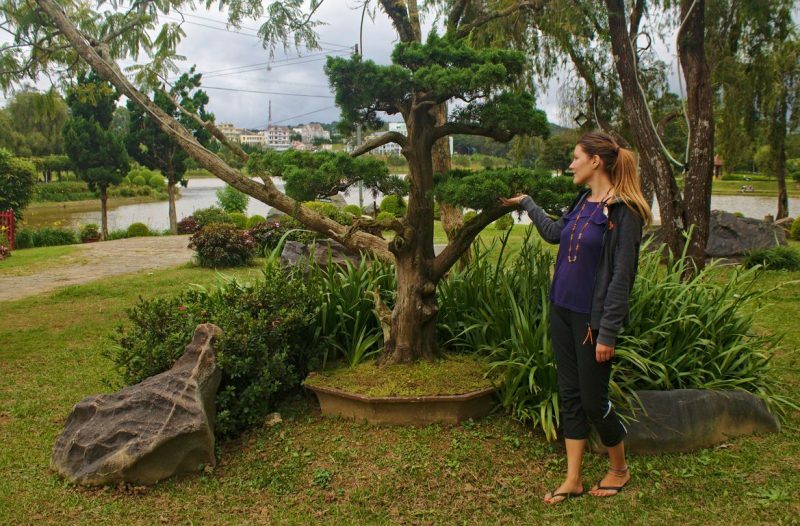 Among a variety of regional and exotic flowers, you can also admire a collection of bonsai trees. It’s the perfect location for an afternoon stroll. You can take a break on the scenic swing or just pose on it for a photo. Have you ever wondered how it is to see yourself on a movie poster? 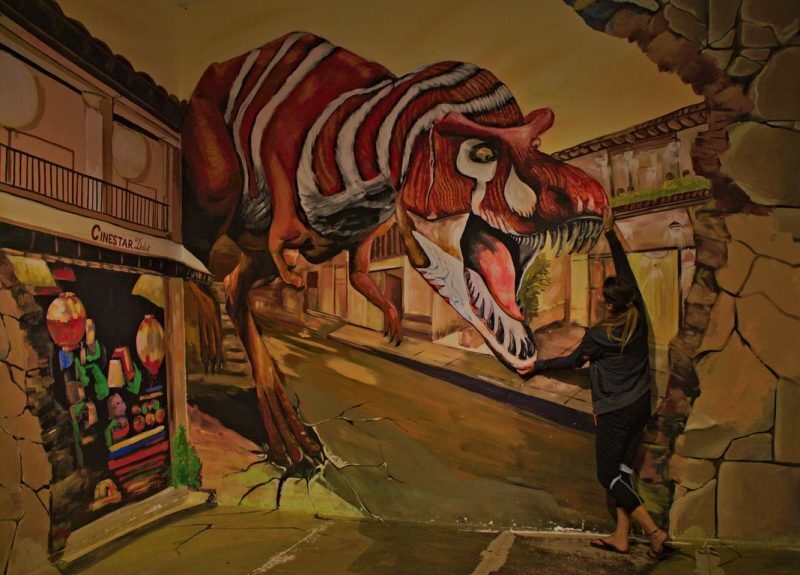 Then you should definitely visit the 3D street art gallery, part of the Cinestar inside the mall. 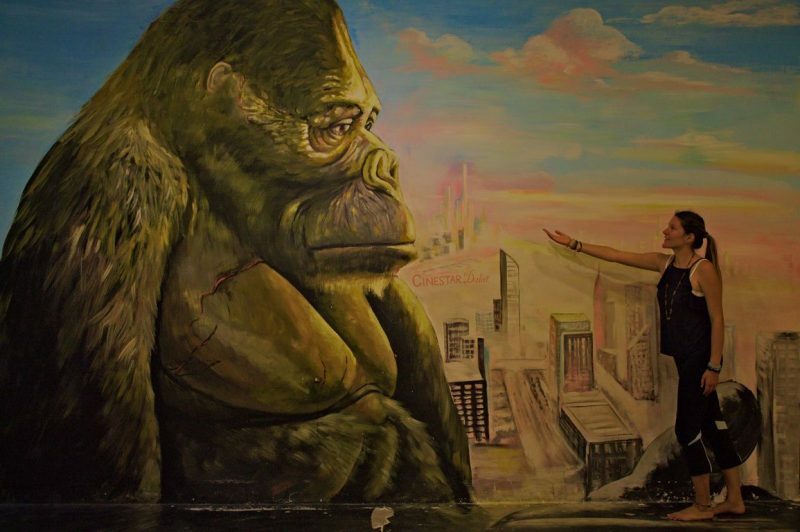 The artworks depict different scenes from famous movies such as Jurassic Park, King Kong or Hitchcock’s classic The Birds. 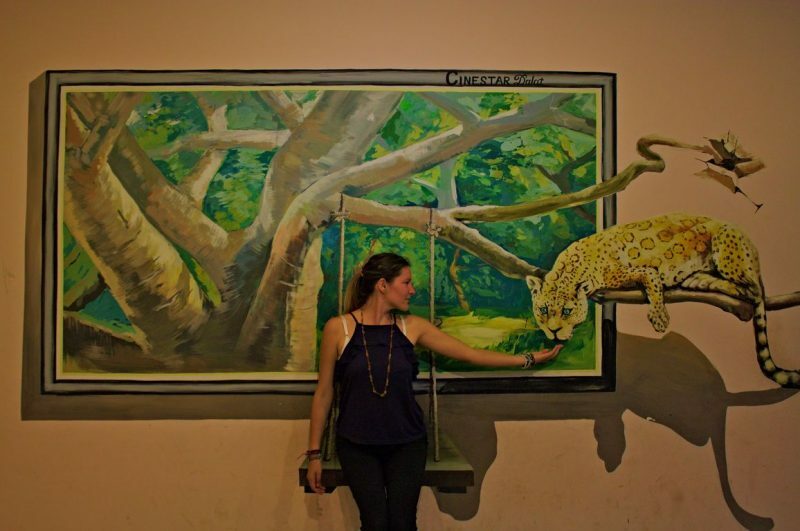 To make it look like you’re part of the scene, you have to stand or sit in certain positions which are shown in the photo on the wall next to the corresponding scene. If you follow the instructions, you will be blown away by how realistic the effect is. You can spend hours posing for the perfect snapshot and it won’t cost you a dime. 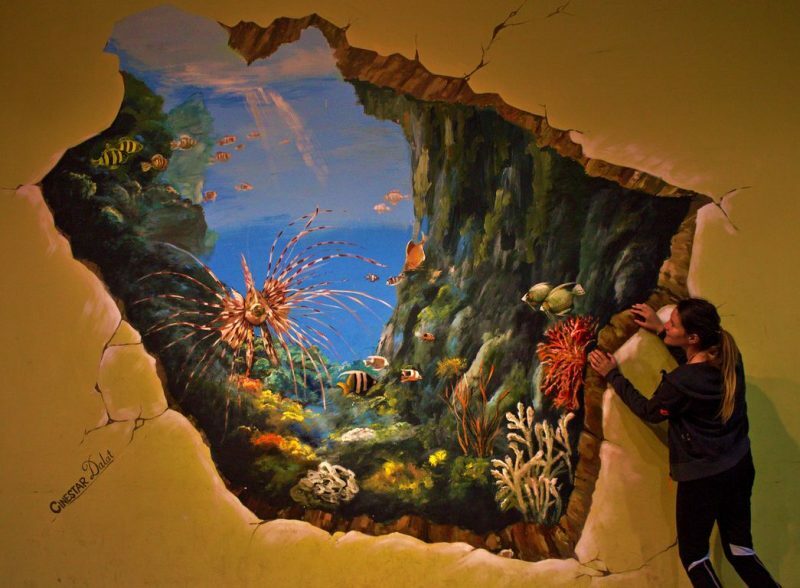 If you can’t do much in the outdoors because the rain won’t stop, go and see the 3D street art exhibition at Cinestar inside the mall. If you consider traveling to Dalat, we advise you to bring something long-sleeved, as you will need it, latest by the time the sun sets. 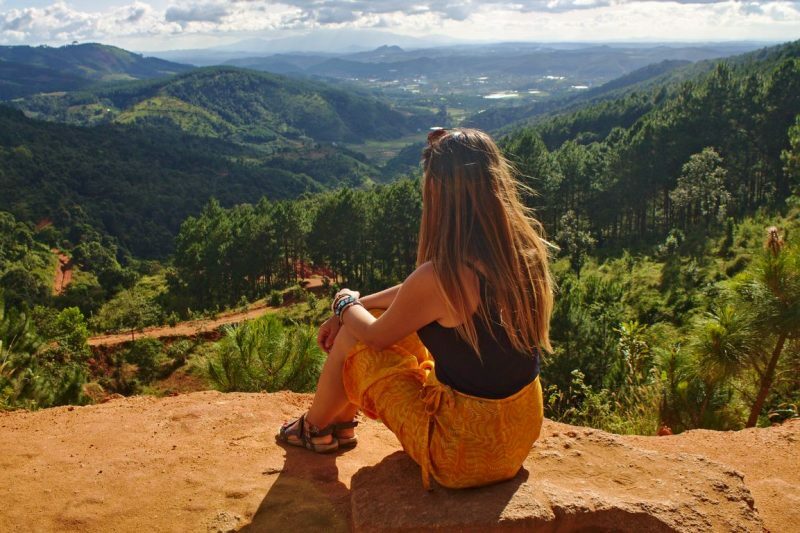 If you travel through Southeast Asia for a longer period and got used to the tropical temperatures, a real cold shock could hit you in Dalat. While it is warm during the day, the wind comes up in the evening and temperatures can drop to 15 degrees Celsius in the winter months. So it’s not a surprise to see locals wearing thick coats, scarves and caps. In the beginning it was an awkward picture for us to meet locals walking around with real shoes instead of flip flops and jackets instead of short-sleeved shirts, but the next day it already felt natural. If you want to stock up on warm clothes for the winter in your own country, the Dalat Night Market offers you the best opportunity to do so. Here you will find jackets, socks, hoodies and caps at unbeatable prices.